← Ann’s Helpful Tips for Tidy Living …. Yesterday was my turn to host knit day. As it happens sometimes knit day is more about the food than the knits. 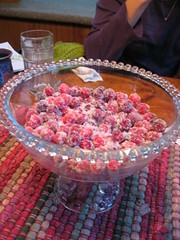 I scored a hit when I served up these sugared cranberries. Kathleen, who always teases me about my Costco cheesecake tricks, was especially enthralled. Aww! How cute is Kathleen!?!?! Love the bowl you had the cranberries in too. Mmm, those look (and sound) delicious!! I love cranberries. LOVE the video action!! More please. Cam is telling all his friends I am on utube! :) I just made him close his ears when the “f” word came on. too funny. those things were awesome though. and awesomely fun! I for one am thoroughly appalled at seeing this woman stuff her face with sugared cranberries, blurt out profanities, and then wink suggestively at the camera. You knitting people are a bad influence on this once innocent lass. And the fact that this type of behavior is now on the worldwide interweb thing for all to see, oh the humanity! I’m making these right now. I can’t wait. Wish I had started yesterday then I could be eating them right now.